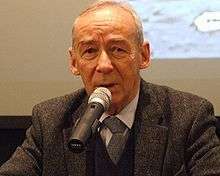 Prof. Andrzej Paczkowski (born 1 October 1938 in Krasnystaw) is a Polish historian. Professor of Collegium Civitas, director of Modern History Studies in the Political Institute of Polish Academy of Sciences, member of Collegium of Institute of National Remembrance. In 1960 he finished studies at the history department of the University of Warsaw. In 1966 Paczkowski defended his doctorate thesis, and was habilitated in 1975. In 1990 he was given the professor degree. In 1974-1995 (for 7 terms) he was a president of the Polish Mountaineering Association (Polski Związek Alpinizmu). Wikimedia Commons has media related to Andrzej Paczkowski. 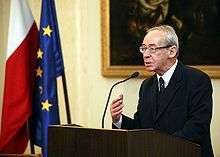 "Andrzej Paczkowski". Information Processing Centre database (in Polish).